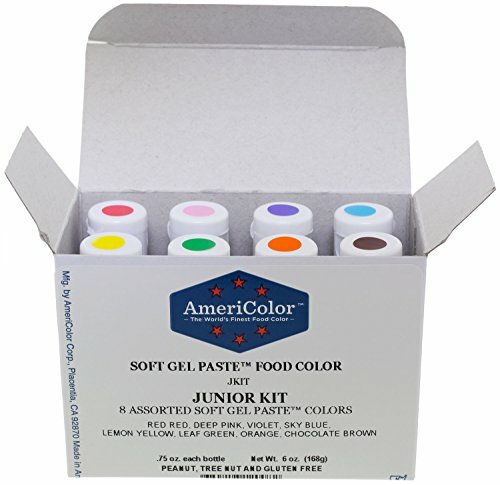 Americolor Junior Kit, 8 Easy Squeeze .75 ounce bottles: Red Red , Deep Pink, Violet, Sky Blue, Lemon Yellow, Leaf Green, Orange, and Chocolate Brown. Nothing you have ever tried equals the coloring strength of these amazing colors. Imagine the coloring power of a paste in an easy-to-use gel. Soft Gel Paste is packaged in convenient squeeze bottles with a flip-top lid. By mixing and measuring using "drops" of Soft Gel Paste, you can achieve precise, easy-to-repeat colors every time. This kit includes the colors Red Red, Deep Pink, Violet, Sky Blue, Lemon Yellow, Leaf Green, Orange, and Chocolate Brown Soft Gel Paste Colors.